Lt. Gov. 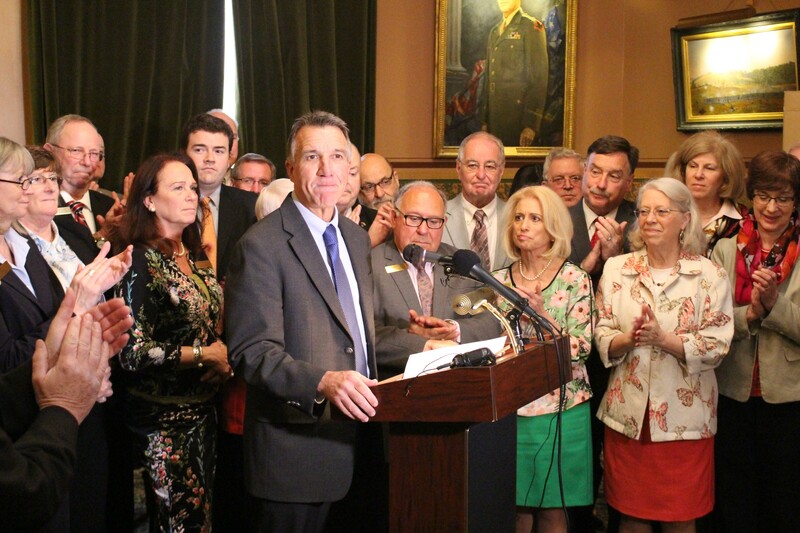 Phil Scott accepts the endorsement of House and Senate Republicans Thursday at the Statehouse. The vast majority of Vermont’s House and Senate Republicans gathered at the Statehouse Thursday to endorse Lt. Gov. Phil Scott for governor over retired Wall Street banker Bruce Lisman. But the crowd of GOP legislators appeared uninterested in weighing in on the the man who became their party’s de facto presidential nominee a day earlier: New York reality television star Donald Trump. When Seven Days asked for a show of hands of those who would vote for Trump in November, Scott quickly intervened. Scott’s fellow Republicans cheered and raised their hands. The lieutenant governor has said for months that he would not support or vote for Trump if he won the Republican nomination. Scott doubled down on that position Wednesday, telling Seven Days that he might write in another candidate for president or skip the contest entirely. Lisman has repeatedly declined to comment on Trump’s candidacy. During Thursday’s press conference, reporters pressed the GOP legislators on whether any of them might vote for Scott and Trump — and whether the LG worried about alienating the 19,968 Vermonters who helped Trump carry the state in March. “I’m concerned about the primary in every respect, and I will work diligently to try and tell Vermont — convince them that I am the right candidate for the job,” Scott said. “Yeah, Kurt!” Sen. Peg Flory (R-Rutland) said.